1 Combine Knorr® Vegetable Dry Soup Mix and all other ingredients, except pumpernickel, and chill about 2 hours. 2 To make pumpernickel bread “bowl” hollow out centre of pumpernickel loaf. Slice bread from centre into cubes and set aside. 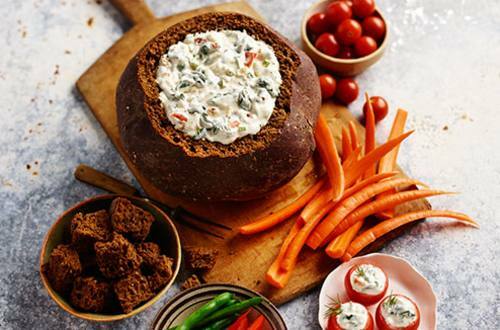 Fill with spinach dip, and serve with fresh vegetables, pumpernickel bread cubes or potato chips. TIP: Spinach Dip Canapés: Hollow out cucumber slices and cherry tomatoes. Fill vegetables with Knorr Spinach Dip and garnish with a sprig of dill.